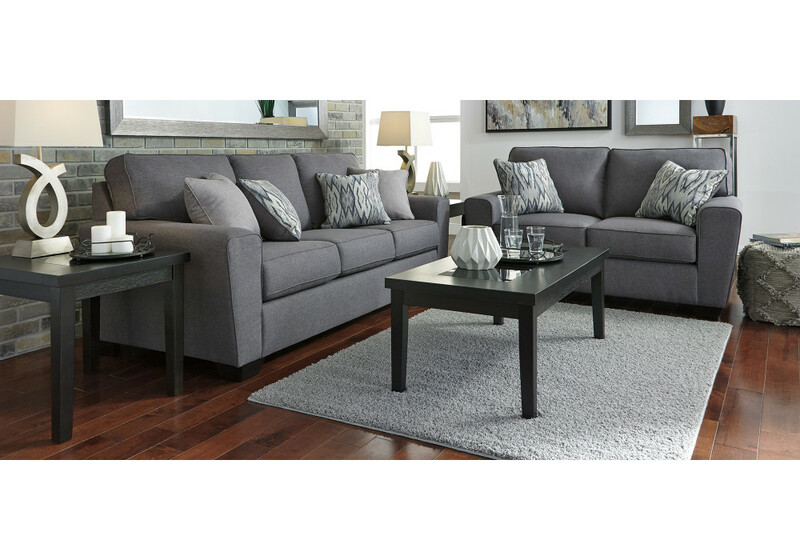 The Altona 3 + 2 Seater Lounge complements so many color schemes and aesthetics. Flared arms, prominent welting and flamestitch-print pillows add just enough panache to this sweet and simple sofa. Supportive seat cushions and extra-wide arms make for one comfortable landing pad. Includes decorative scatter cushions. Corner-blocked frame made from solid hardwood. Exposed feet with faux wood finish. Seat constructed with high-resiliency foam wrapped in thick poly fiber. Upholstery made using 100% polyester fabric and pillows with soft polyfill. The Altona 2 Seater Lounge complements so many color schemes and aesthetics. Flared arms, prominent .. The Altona 3 Seater Lounge complements so many color schemes and aesthetics. Flared arms, prominent .. In the chicest shade of gray, Altona sofa sleeper’s linen-weave upholstery complements so many color..